A green balloon dog. 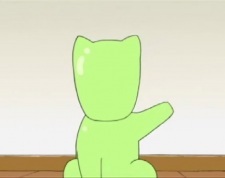 Named for the color of his body, but supposedly unrelated to the other Kimidori-san. Created by Yuki Nagato, Achakura becomes good friends with him, even though Yuki and Kimidori-san plays tricks on Achakura. Has a slightly irresponsible (some would say shameless) nature, but he does genuinely care for Achakura.